With so much of the US dealing with extreme cold, and both ice and/or snow storms, we thought we’d review some important Do’s and Don’ts for solar products, particularly solar lights. You may not be able to use all lights for the duration of the current weather, but these tips will help you make sure that they work long after the weather settles down. First of all, we hope that you’ve read our articles on preparing for winter, most importantly: what should be taken inside during freezing temperatures or to avoid being hit by snow removal. If you haven’t, take what you can inside now and for the rest, hope for the best. If you have questions, email us at Info@SolarFlairLighting.com and if we can, we’ll help you. These are the things that you should have taken in before the storm. If you didn’t, take a broom and gently poke in the area where they are. Depending on how deep the snow is, you may be able to brush enough snow off with a broom and pull them out before the heavy equipment comes in. No light is worth a broken limb or bump on the head because you slip on ice and hurt yourself. If the solar light is in a slippery area, let it be. 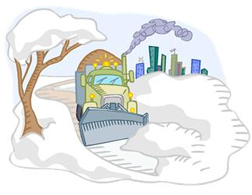 And if the plows are on your street, don’t go running out and try to pull things out of the way: there is a very good chance the driver may not see you and even if he/she CAN see you, the road conditions mean they may not be able to avoid hitting you. Again: use common sense: if it’s too slippery to remove them safely don’t. But if you can safely walk to the area, do so and take the lights in before the chemicals go down. Sand, salt and other de-icing do make walkways much safer to walk on. But any of the three can damage the solar panels and solar fixtures. The chemicals will cause corrosion and the sand can scratch the lights and/or the solar panels. If it’s too slippery and you really want to get the lights, try throwing down some sand or kitty litter so you can walk to the area safely before adding the heavy duty chemicals. Who Without Cats Would Have Kitty Litter? Anyone who drives in the snow should keep a bag or two in the trunk of your car and somewhere in your house. Cat litter provides traction that can help if your car gets stuck in a small amount of snow. Just throw it down around the wheels — WHEN THE CAR’S MOTOR IS OFF and make sure you aren’t behind the car when you do it. Throw it down from an area in which you will be safe if the car moves. And, as noted above, it’s a non-toxic way prevent slips and falls on icy, snow-packed or even wet walkways. Aside: Since it is flu season, cat litter also is very helpful when cleaning up vomit. Not too be gross, but people (especially kids) can’t always make it to a bucket or toilet in time. Whether it’s the clumping kind or not (and the clumping kind isn’t great for preventing falls since it clumps once it gets wet), cat litter does cover some of the smell and let you “sweep” the mess onto an old newspaper instead of trying to clean it up with a cloth. After the big mess is gone, that’s when you take out the bucket and mop. If you rely on solar lamps, flood lights or spotlights to reach your doorway or auto safely, it’s a good idea to brush snow off of the solar panels and any glass or plastic panes. It’s best to use a soft broom to remove snow off of panels. We use a duster with an extendable handle to clean snow off of our floodlights. 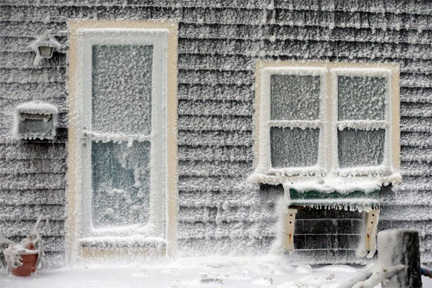 If the ice is mixed with snow, do not try to chip it off of panels or fixtures. The risk of damage is just too high. Ditto for snow melting chemicals. As mentioned above, this is a sure-fire way to destroy the fixture and panels. Just make sure that you do so gently so that you don’t break or scratch the panels or fixtures. Once the temperature is warmed up, it is okay to use warm NOT HOT water, to loosen up stubborn ice. But don’t do it when the temperature is any where near freezing. Especially: do not pour warm water on breakable items when the temperature is below 25 degrees. In freezing temperatures, solar panels as well as plastic housing or glass and/or plastic panes are suddenly exposed to heat, there is a very good chance either the solar panel or they will shatter. I found this out the hard way when I was in a rush to get to a meeting and my windshield was covered with a mixture of ice and snow. I scraped for 20 minutes and was getting nowhere, even with the defroster moving. Being impatient, I thought I was smart to throw some hot water on to speed up the process. Again: no lighting fixture is worth injuring (or worse) anyone. If accessing an area means using a ladder and the ground is slippery, it is not safe to use the ladder. Period. To be clear, those items that usually require ladders are solar panels for shed lights, as well as solar panels and fixtures for floodlights. Snow on spotlights and solar lamps usually can be brushed off with a soft broom easily and safely. Let’s assume that there is no way to safely access the solar lights or the panels until the snow and/or ice melts. Just as with regular electric lights go out when the power does, or some electric lights may be covered with snow, it’s not the end of the world and it’s not permanent. However, solar lights with panels unexposed to the sun for 3 or more days will have a “cold” rechargeable battery with a weak charge. There is an easy fix for this. Just like when lights are new, you’ll get the best performance and prolong the life of the batteries by turning the fixture off for two sunny days to let the battery store up a full charge. At the end of the second day, turn the light back on and you’ll see the best performance in the short-and long-term. All Rights Reserved. This post/article may not be used in whole or in part without express written consent. This entry was posted in What's New and tagged outdoor solar lights, solar lights, solar lights and ice, solar panels by SolarLightingSmart. Bookmark the permalink.